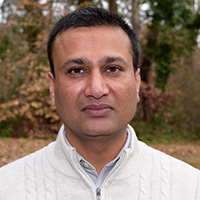 Subir Goyal, MPH, MBBS, is a Biostatistician Senior within the Bioinformatics and Biostatistics Shared Resource at Winship Cancer Institute of Emory University. Subir is a PhD candidate in Epidemiology at Kent State University, Kent, OH. He obtained his Master of Public Health from Florida State University in Tallahassee, Florida. He received his Bachelor of Medicine and Bachelor of Surgery from Nagpur University, Government Medical College in Nagpur, India.